For today’s Dig Through Time, let’s delve back to 2001-2002 for Odyssey block. 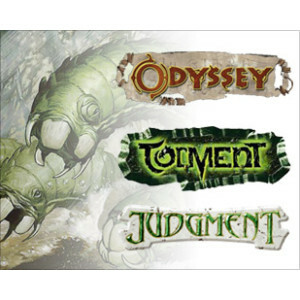 This block was composed of Odyssey, Torment, and Judgment, and gave us the mechanics flashback, threshold and madness. In case you hadn’t noticed, I love using the graveyard as a resource, and this block introduced lots of really fun graveyard interactions. Flashback lets us cast an instant or sorcery from the graveyard for an alternate cost. 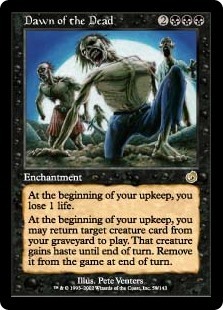 Threshold gives us some benefit so long as we have at least seven cards in our graveyard. Madness lets us cast a card from our hand for an alternate cost if it is discarded. I won’t actually cover too many cards with those keywords, but those mechanics are the backdrop of the set, and you’ll see plenty of synergy in the cards I highlight. As usual, I’m open this article with some cards from a really cool, relatively-unknown cycle, Dreams. The Dreams cycle features some nifty instants and sorceries that require you to discard X cards from your hand to get an X effect. Remember from my Mercadian Masques article that I’m a sucker for cards that get you value for discarding, and this cycle has some big potential along those lines. 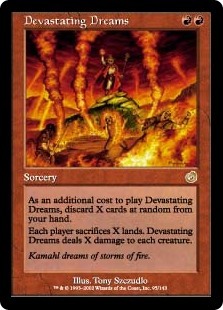 According to a quick search on EDHREC, the best-used member of this cycle is Insidious Dreams at 764 decks. Let’s take a look at the rest of the family. Restless Dreams sees play in 13 decks, and may not seem very good at first glance. There are numerous Raise Dead effects in the game. 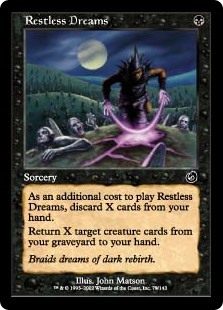 Usually those effects are just worse versions of Reanimate; Restless Dreams, however, lets you set up your hand and your creatures any way you want. It’s basically a more selective Living Death between your graveyard and hand. This card is so underplayed that when you put it into EDHREC, you don’t get any results for Top Commanders, but there are tons of Commanders that gain value from certain creatures being in the graveyard. I think this card would be especially sweet in Meren of Clan Nel Toth, Sedris, the Traitor King, The Mimeoplasm, Sidisi, Brood Tyrant, or Karador, Ghost Chieftain, just to name a few. Devastating Dreams is a spicy two-edged sword that sees play in 68 decks. Random discard is a bitter pill to swallow, but, if timed correctly, can lead to a somewhat pyrrhic victory. To me, this card is red’s version of my beloved Death Cloud. Daretti, Scrap Savant plays Devastating Dreams the most at 11 decks. That seems correct, since you can dump your hand, clear the board, cut your opponents’ resources down, and keep Daretti in play to reanimate your artifact creatures or mana rocks. Other worthwhile commanders include indestrucible ones like Mogis, God of Slaughter, Tajic, Blade of the Legion, and Zurgo, Helmsmasher. Additionally, many Jund commanders have enough toughness to stand up X damage, and are in the correct colors to reanimate lands and other creatures. Think about putting this card in your next Prossh, Skyraider of Kher or Kresh, the Bloodbraided brew with The Gitrog Monster, Splendid Reclamation and Sheoldred, Whispering One thrown in for extra spice. Nostalgic Dreams is the original Wildest Dreams, and sees play in 278 decks. What makes this card so good, in addition to the low converted mana cost, is the flexibility of getting back anything. 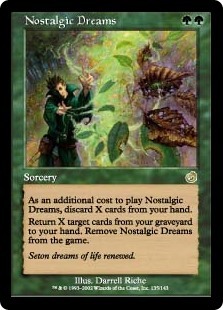 If you enjoy Regrowth, Restock, or Seasons Past try out Nostalgic Dreams. Wort, the Raidmother plays Nostalgic Dreams in 26 decks, which is more than any other commander. If you copy Nostalgic Dreams, you only have to discard once, and the second copy can actually get back all the cards you discarded when you first cast it, which is why conspire from Wort is so nice. That’s why it’s also a great card in Riku of Two Reflections. Honestly, if you’re playing green at all, you should try this card. Balancing Act is a more fair Balance that sees play in 62 decks. If you keep a lean board presence, forcing your opponents to sac down to your level can make for a formidable board wipe. Alternatively, if your deck isn’t great at drawing cards *cough* mono white *cough* you can keep the green, black and blue player’s hand sizes in check. Throwing something like Ghostway into a deck with Balancing Act will reduce your permanent count, hopefully setting your opponents back even further. Four commanders are tied for playing the most Balancing Act at three decks each: Karona, the False God, Karador, Ghost Chieftain, Sen Triplets, and Atogatog. I think this card would be worthwhile in a Kaalia of the Vast build, since you often have a smaller board of bigger creatures, and don’t necessarily care about losing your lands and mana rocks. Stax and prison commanders like Grand Arbiter Augustin IV and Hokori, Dust Drinker seem like they could benefit from Balancing Act, as well. Pulsemage Advocate is a pretty interesting effect in white that sees play in 250 decks. The cost seems kind of hefty, but, you can respond to an opponent’s Ever After or Victimize, to make them cast those creatures fairly, while you cheat your big beater into play for free. You can also use the Advocate as a political piece. Return Swan Song and two lands to an opponent’s hand in response to your other opponent’s overloaded Cyclonic Rift, while also reanimating your innocuous Hero of Bladehold. Phelddagrif plays Pulsemage Advocate the most at 75 decks. Additional EDHREC suggestions include Ayli, Eternal Pilgrim, Gwafa Hazid, Profiteer, and Gahiji, Honored One. I think it could see play in Athreos, God of Passage, Anafenza, the Foremost and Atraxa, Praetors’ Voice. If you don’t care about being nice, and want to mitigate the value you give with Pulsemage, run it with Curse of Exhaustion, Orim’s Chant and Eidolon of Rhetoric. Web of Inertia is a slick piece of graveyard hate/pillow fort tech that sees play in 251 decks. This card can be a free Relic of Progenitus or Scrabbling Claws each turn. Running cards that are just good anyway like Rest in Peace, Bojuka Bog, Nihil Spellbomb, and Tormod’s Crypt turn this card into a better Propaganda. Even if you don’t hit one of those cards, restricting your opponent’s options is usually a good decision. Leyline of the Void, Rest in Peace, and Planar Void, also guarantee that you can’t be attacked. Oloro, Ageless Ascetic plays Web of Inertia the most at 42 decks. Of the new 4-color commanders, Atraxa, Praetors’ Voice is probably in the best colors to use Web of Inertia, but Yidris, Maelstrom Wanderer could also make potent use of it, as well as Breya, Etherium Shaper. Mist of Stagnation sees play in 77 decks. It is an excellent and oppressive stax piece. If you run this with cards like Rest in Peace or Planar Void and Loxodon Gatekeeper your opponents will never see another turn. Of course, you’ll have to set up ways to keep your stuff untapped. Teferi, Temporal Archmage and Seedborn Muse are two of the best ways of keeping your resources untapped. Murkfiend Liege can get back just your creatures, if you’re running a mana dork package instead of a mana rock package, while Unwinding Clock will get you the opposite effect. Tasigur the Golden Fang plays this card the most at 10 decks. 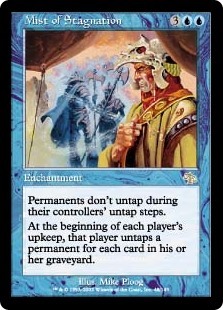 That really surprised me, as I thought Teferi, Temporal Archmage would have been the top deck for this card, but he doesn’t even appear in the list. Possibly because blue isn’t great dealing with the graveyard. 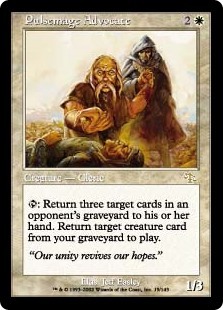 Sidisi, Brood Tyrant or Gisa and Geralf would use this card effectively, since those decks are all but guaranteed to have more cards in the graveyard than anyone else. Speaking of putting cards into the graveyard, Morality Shift sees play in 114 decks, and will get your whole library there in one go. This card lets you set up some powerful plays with cards like Past in Flames, Dread Return, or Creeping Renaissance. Morality Shift is already expensive at seven mana, but if you need more, and have it in hand, Glorious Reclamation can ramp out every land in your library. Balthor the Defiled plays Morality Shift the most at 28 decks, which makes sense, since he’s a Twilight’s Call on a stick. Sedris, the Traitor King, Jarad, Golgari Lich Lord, and Dralnu, Lich Lord, among many other graveyard-oriented commanders can benefit greatly from an early Morality Shift. Dralnu is nice, in particular, because he will let you reverse the exchange, if you need to. Dawn of the Dead sees play in 294 decks, and is kind of like Debtor’s Knell, but without the prohibitive mana cost, and about 65% more flavor. One very important point about the wording: if you have a sac outlet, or the creature dies by some other means, it isn’t exiled and you can reanimate it again next turn. Another good method for getting extra value out of Dawn of the Dead is Conjurer’s Closet. Blink the creature with the Closet and you just get to keep it, on top of getting its enter the battlefield effect again. Being a sac outlet herself, Ayli, Eternal Pilgrim plays Dawn of the Dead the most at 48 decks. According to EDHREC, some of the other top sac outlet commanders for this card are Ghoulcaller Gisa, Grimgrin, Corpseborn, and Yahenni, Undying Partisan. 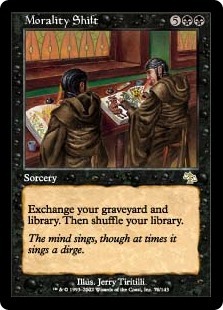 Definitely think about this card the next time you want repeatable recursion. 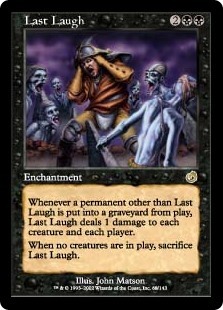 Last Laugh is a continual board wipe waiting to happen that sees play in 127 decks. You don’t even need creatures to set it off when you run cards like Nihil Spellbomb or Mindstone that sacrifice themselves for value. Running Last Laugh with Everlasting Torment ensures that anything it doesn’t kill, it will at least maim. If you wanted to go all-out with a -1/-1 counter strategy you could add in cards like Blowfly Infestation and Crumbling Ashes. 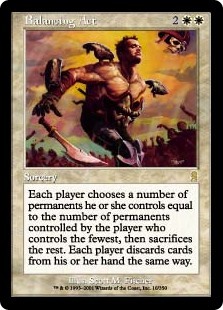 Mogis, God of Slaughter plays this card the most at 16 decks. Last Laugh could be an interesting piece of tech in a Shadowborn Apostle build, each time you fetch a demon with your apostles, you get a damage-based board wipe. This card is also nice with Yahenni, Undying Partisan since Yahenni will always survive Last Laugh, and you won’t have to sacrifice it to an empty battlefield. Burning Sands is an extremely punishing, but easy to build around card that sees play in 255 decks. Playing very few to no creatures is one strategy. Running a couple creatures that go tall, rather than wide, is another. I think a voltron strategy might be best, though, since you can send your commander to the command zone, which will replace the death trigger on Burning Sands. Mogis, God of Slaughter plays Burning Sands the most at 68 decks. Give this a try with either Akiri, Line Slinger or Vial Smasher the Fierce and a partner, since Partner commanders let you play around Burning Sands with two creatures. Seedtime is run in 126 decks, and is the surprise the blue player never sees coming. It’s usually correct for you to play Brainstorm at the end of your last opponent’s end step. It’s usually hilarious to respond to Brainstorm by taking an extra turn. 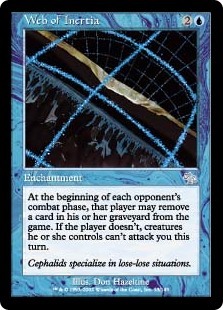 Blue is one of the top two colors played in EDH, so it’s unlikely you’ll have a problem casting this. 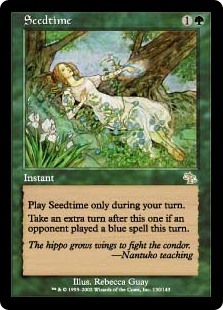 Seedtime is very much a goodstuff card, and can go into any deck that supports green. Omnath, Locus of Mana is EDHREC’s top Seedtime commander at 13 decks. 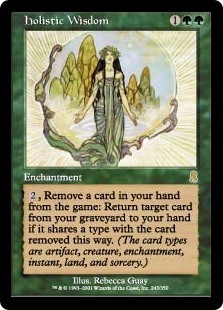 A Wort, the Raidmother deck where you could easily copy it, would be another strong contender. If you often find yourself a turn away from comboing off, throw Seedtime into Ghave, Guru of Spores, or Prossh, Skyraider of Kher. This card is even worth running in Ruric Thar, the Unbowed, six damage be damned. Holistic Wisdom is a really unique recursion card that sees play in 117 decks. In addition to having some sick Rebecca Guay art, this card gives you the best pick of your graveyard at instant speed for just two mana and a card from your hand. Holistic Wisdom pairs well with the few cards that let you circumvent the exile zone: Eternal Scourge, Misthollow Griffin and Riftsweeper. Or you could just put it in a deck that draws such a filthy amount of cards it doesn’t care about permanently exiling a few. Riku of Two Reflections plays the most Holistic Wisdom at eight decks. Hunting Grounds is like the little brother to Lurking Predators. Considering how popular Lurking Predators is (2,856 decks), I’m surprised Hunting Grounds doesn’t see more play (315 decks). 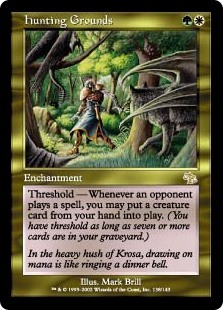 Threshold isn’t particularly difficult to achieve in EDH, and green has lots of ways to refill your hand. This card has lots of potential. 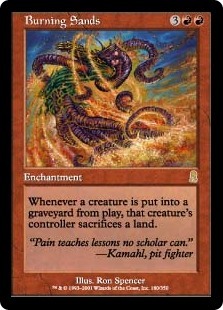 You could drop Avacyn, Angel of Hope for free in response to a Wrath of God; you could cheat in Elesh Norn in response to a combat trick, or you could counter a Counterspell with a free Mystic Snake. Mayael, the Anima plays Hunting Grounds the most at 45 decks. It’s also fantastic in decks where you can find the correct creatures, or draw many of them quickly like Captain Sisay, Tymna, the Weaver + Sidar Kondo of Jamuura, and Ravos, Soultender + Ikra Shidiqi, the Usurper. Charmed Pendant is played in 40 decks. It has the potential for big payoffs if you’re playing cards like Sensei’s Divining Top and Scroll Rack, or things like Oracle of Mul Daya and Vampire Nocturnus with some good shuffle effects to ensure you’re getting the best possible value from the top of your library. Charmed Pendant could really put in work for commanders like Sheoldred, Whispering One or Anowon, the Ruin Sage, since black likes lots of black pips in the its card’s costs, and is number one at reanimating creatures. Though it usually ramps with lands, green is another great choice since it also gets to bring back cards from the graveyard, and who wouldn’t want the chance to hit Khalni Hydra for a cool eight green mana? Another commander that benefits from milling herself, Sidisi, Brood Tyrant plays Charmed Pendant the most at 13 decks. This could also be excellent in Dralnu, Lich Lord, with flashback letting you cast each card you mill. So long as you have consistent top deck manipulation, Charmed Pendant is a strong consideration for both ramp and card advantage. For this week’s cards in action decklist, I’ve done a bant variation of my Kruphix, God of Horizons group hug/force feed deck headed by Sidar Kondo of Jamuura+Thrasios, Triton Hero. Unlike my Kruphix deck, this list features some nasty prison and lockdown pieces to keep your opponents from using any of their toys. I hope you enjoy, and I’ll see you in two weeks with another spread of underplayed gems.